Beyond the official membership standard noted above, Post 411 has adopted the following dress code pertinent to Legion associated meetings and events. For formal and semi-formal official (public) events, such as ceremonies and funerals, officers, dignitaries, Legion affiliated speakers and members are asked to adopt the following standard attire, though some measure of flexiibility is permitted. Though unrequired, we welcome and encourage the wearing of an American Legion shirt of choice (collared, polo or t-shirt). For cold weather, outdoor events, a Voyage Jacket is optional, but again encouraged. For monthly Post meetings, the service cap is the only required uniform item. For less formal Post gatherings, no service cap is required, but members are welcome to wear an American Legion shirt of choice (polo or t-shirt) as an identifying membership indicator. 1. The left side (emblem side) of the cap is reserved only for the Legion emblem, city, county, district, or state lettering. Consecutive membership insignia/stars and/or authorized Legion/military service badges. Names or nicknames of individual members cannot be used on caps. 3. 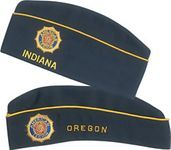 The Legion uniform cap should be worn by its members only when in attendance at official Legion meetings or ceremonies or as official guests at patriotic or other civil functions or by individuals when officially representing The American Legion on public occasions. 4. A member is considered to be in uniform if wearing an official Legion uniform cap. Therefore it is not proper to wear the cap while eating a meal at an official Legion or civic luncheon or dinner. 5. The cap should be worn in a place of worship only by the Guard of Honor, Color Guard, and Commander of same while in marching order or standing guard. When returned to and seated in pews, the cap should be removed.Legion posts marching in formation into a place of worship should uncover at the door, hold the cap with the right hand over the heart until the arrival in the pews and commanded to take seats, remaining uncovered during the entire service. At the close of the service, upon command, the post shall arise, the members holding the cap with the right hand over the heart will march out of the place of worship and recover after marching through the door.Legion members not in formation will uncover upon entering the place of worship and remain uncovered during the entire service and will recover after leaving the place of worship. 6. When at a funeral, the cap should be held over the heart as one approaches the casket and is not at any time worn in a place of worship (except by the Guard of Honor, Color Guard, or Commander of same while in marching order or standing guard.) At graveside, the cap should be held in the right hand over the heart during the entire service. 7. In cold and inclement weather, the cap should not be worn. 8. In Legion meetings, the cap should be worn except during moments of the Pledge of Allegiance, prayer, and when standing in silent reverence in memory of departed comrades, when the cap should be held with the right hand over the heart. 9. Female members of the Legion should wear their caps in the manner prescribed for female personnel of the armed services.